Hopefully this page answers some questions a lot of you have been asking lately! Also a SCENE CHANGE. Wow! 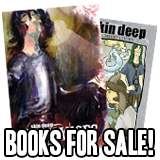 Did you know that my Patreon backers got to see this page a whole day early? For only $2 a month you can too! Also is that a wild Jim I see in panel 5? He has brown hair. I bet that’s Paul. It’s Paul. Note the brown hair. Unless they thought hopping green and orange Elenor (or other bandersnatch) was Jim. And, remember: in this time-frame, Jim is a university student in Missouri. He’s met Michelle, but she hasn’t turned yet. It does make me wonder how things are going for Paul and Jon, without Jim and Lorne feeding off each other’s teasing behaviour toward those two. Yay! Tony is finally happy! Let’s see how long it will– half a page. Well… it’s still progress, I suppose. Party-Thongs are a very mythical species… obviously. 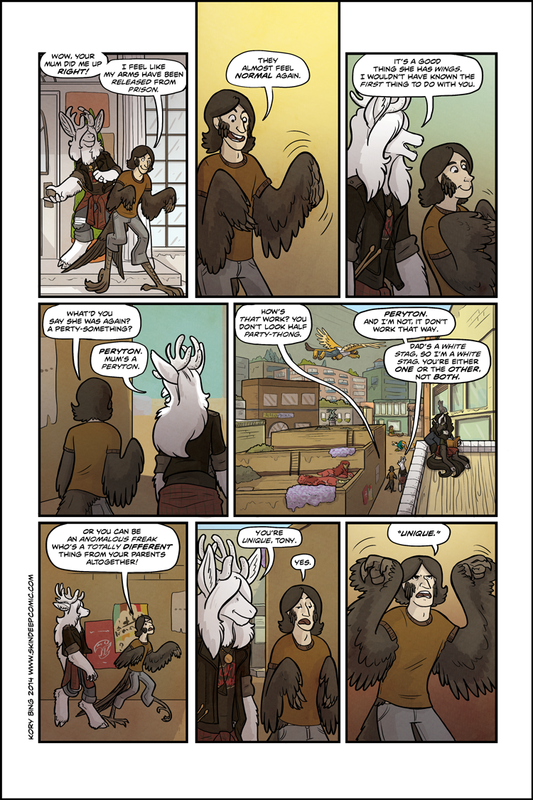 Also, are those Manticores chilling out on the roof in panel 5? :0 I didn't think there would be any around in an Avalon! they look like they have their tails clipped, or shaved. There was a wild post somewhere about this, they do it as a gesture of good faith. Kory said they’re called Statler and Waldorf. Statler and Waldorf? Like the hecklers from the Muppet Show? Awesome! Non-manticores can’t pronounce their real names. And here I thought it was possible with Ike, because manticores are classified as “Monsters”? Tony is adorable when he smiles. Hey! It’s Paul and Statler and Waldorf! Good to see he’s getting the hang of walking. What kind of toilets do they use that clipping his tail feathers wasn’t an important issue for him? While many tailed creatures can use their medallions to easily use human toilets, there must be a wide variety of toilets in the Avalon to support monsters and those without medallions…though I suppose a simple bucket or hole in the ground might suffice. That makes me wonder how many intelligent “monsters” live in the Avalon(s)? Unlike the other residents they have no choice but to hide away in Avalons, so I would almost think they’d make up the majority of the population; but that doesn’t seem to be the case. Hmmm, interesting point about the toilets. Maybe the standard for the Avalon is to mount it in the floor like Asian squat toilets. Hm. Well, Tony is avian, so I’d assume that it works a lot like a bird: step up on a perch (or something) and poo in the toilet from there. I guess that would be a lot like a squatting toilet. Oh god, I nearly spat soda on my screen…. Can you imagine what could happen after he learns to fly and decides to master “bombing runs”? Annnnd this is the part where my maturity ran out, and I started giggling at work. My own son is questioning my sanity now. I’m laughing so hard I’m crying. Oh goodness, Tony looks *so happy* in the 3rd panel. I don’t think we’ve ever seen him so happy. Blanche is carrying a pair of drumsticks in his belt. Now I have this overwhelming curiosity to see his dad…. Maybe Elise has formally been sacked from The Four Horsemen, following the events in Exchanges. If that’s the case then Blanche would need to do a fair bit more practice work with the band. That had occurred to me. Could also be that he is now thinking more seriously about his skills, and is more interested in finding a regular gig with a band? Greater levels of practice would be mandatory in either case, of course. Aww, it’s great to see Tony looking so much happier. And Blanche seems to have shed the velvet from his antlers! no, those antlers still look kind of velvety to me. In the character study of Blanche and his antlers, on the SD Wiki, it shows that the antlers shed velvet over the course of September, and are free of velvet by November. I bet at this point Tony would be happier being a “normal” magical creature with a medallion than a… whatever he became. I mean, he’s probably rather used to the avalon (or at least too busy wallowing in self-pity to keep pondering about the avalon’s weirdness), so he wouldn’t freak out that much about being any other creature, but if he had a medallion he could at least return to a common human life. Happy Tony is best Tony. That depends on a number of things. 1. What Tim is able to learn over the coming months in the strip, of the spellbreak which transformed Anthony. 2. Whether Anthony learns how to keep his feathers permanently and properly clipped. 3. Whether Anthony ever wants to learn to fly. 4. Whether the internal structures of Anthony’s bones were transformed to the hollow, lighter, bone structures of a bird. “Unique.” And with hands that are nicely configured for making impressive air quotes, Tony, don’t forget that! It’s all lies, and my toe bones are too long. I might change back again. Cos I can’t go back to where I was before. ‘Cos I know, with these hips and thighs, I can’t fly. And my sideburns have grown longer overnight. Dermot: Hey, steady on the perch, there! David: Yeah, no falling off, mate – someone could get hurt! More important, you could get perch-banned! Welp, those two are heraldic creatures, while perytons are a modern literary invention, but other heraldic creatures have made an appearance, so yeah! A creature with the head of a fox and eagle forelegs? I’m all for it! I wonder if that last panel, as well as once again reminding us Tony doesn’t much approve of his current predicament, is intended as some kind of foreshadowing; especially if his dad turns out to be the root of all his problems. The real plot twist would be if it turned out that aellean harpy was in the family history on both sides of the family. If Tony turns out to be a siren of the older type- The bird body mentioned- Then what happens the first time he tries singing? The fact that he is based on a frigate bird, (A marine species) does make that seem more likely. It would be VERY interesting if it turns out his mom is a siren… And knew it all along. I think he would still be an anomaly, since Sirens are traditionally female. As are harpies, which is also the most accepted theory, even to the characters themselves. OMG, he’s a Tangata Manu! The Tangata Manu, winners of an egg collection/swimming contest on Easter Island, were often depicted n art as ” Frigate Bird/Human hybrids.” So he’s likely to have some Polynesian ancestry; this fits with his father being a sailor. Can I assume that Tangata Manu aren’t exclusively female? They may even be exclusively male. I got that impression honestly. Wow… I looked up that contest, and it was kind of terrible. The “contestants” were all men in important positions in their society, and they would appoint men of lesser station to do the (often deadly) race for them. Once someone managed to find the first sooty tern egg of the season, fast, fashion a basket to carry the egg in, swim back across shark-infested water, and climb a steep cliff with the egg basket tied to his forehead, the “contestant” who appointed him gained all the glory and was treated as a religious icon (“Tangata Manu”) the rest of the year. I’m not sure if the people who actually risked their lives got anything for it at all. It’s a sad fact that they’re feared in the community. Possibly the only reason being their poisonous tails and viscous teeth. The first being a friendly reason of why they chose to have their tail docked or sheathed. I noticed one has a human face and another lion. 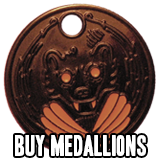 Would that mean there’re multiple types of Manticore, or is this medallion magic? And will wings ever come into play? The SD Manticores have sub-species, human and lion-faced, so yeah, there are multiple kinds. Neither have wings (sadly). Probably just a design choice on Kory’s part. Kinda like how they have spines instead of a scorpion stinger-like tail. Hey, looks like Tony is standing on his toes like he should! He’s getting used to his new body! He’s an Archeopteryx. Calling it now. No, but wait, the guy in the last story was a blend of his mom and whatever his dad was, wasn’t he? Ike’s birth was a particular and fairly rare magical circumstance. Here, Blanche is talking about how it works when unstable sorcery is not involved. Hey, if Blanche is still playing the drums, maybe they’re going to band practice? How amusing if they needed someone to fill in for vocals and Blanche suggests Tony because he doesn’t have a “half-bad voice” or something. Cue him singing and everyone immediately fawning over him. Blacnhe’s mom reminds me of those creatures that look like canine/bird hybrids. Anyone know what those are called? If you can only be one or the other, and Ike is both, I guess he’s ‘unique’ too? Didn’t Ike explain the halfbreed thing to Anthony? I’d like to know what that fluffy fellow with the book is. He looks a little unicornish.